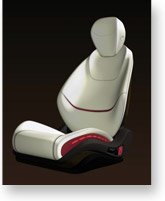 It debuted its concept seat, the Sustainable Comfort 1.5, at the Los Angeles auto show last week. While it does not have any contracts in hand, the company could be ready to begin production by 2014, said Greg Brncick, innovation manager for Faurecia's seating products group, in an interview. 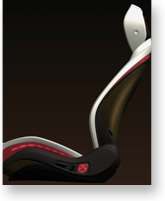 Faurecia showed a version of the Sustainable Comfort seat as part of its 2008 auto concepts, noting that it would be 17 percent lighter and up to 30mm thinner than a traditional front seat. While the company is not giving specifics on its 1.5 version, it still expects to meet or beat those targets. Faurecia ranks No. 8 on the Automotive News Europe list of the top 100 global suppliers with worldwide sales to automakers of $17.7 billion in 2008.